The final Fluval G Series trailer has been released. This trailer highlights the Hydro Tech Performance Monitor as well as 360 degrees views of the Fluval G Series filters. We just can’t get over how nice these filters look. The LCD display looks very promising and certainly brings aquarium filters up to a new standard. Hopefully we can get our hands on one of these soon and post an RT testimonial. We introduced the new Fluval G Series of filters in Fluval G Filter from Hagen: Designed by Consumers. Well, here comes the official Press Release from Hagen. The new G Series takes a huge aesthetics leap forward. “The Future of Filtration”, combines sleek appearance with elite performance. Rolf C. Hagen, Inc. is marketing its new Fluval G Filtration System around the theme, The Future of Filtration. In that case, the “future” looks very bright indeed for aquarium hobbyists and the Fluval dealers who serve them. The introduction of the Fluval G not only sets a new standard for aquarium filters, it essentially redefines the entire category by offering a unique combination of aesthetics, monitoring capabilities and performance features. Aquarium enthusiasts will be able to tell that the Fluval G is no ordinary filtration system just by looking at it. The new filter is so stunningly attractive, it almost demands to be shown as part of the aquarium, rather than being hidden away behind cabinetry. Evoking a contemporary high-tech image, the Fluval G features a stylish cubic design, a gloss back finish, chrome and aluminum detailing and a backlit monitoring display. Featuring 63 distinct screens, the Hydrotech™ Performance Monitor puts a world of information at the hobbyist’s fingertips, including water temperature, water flow, conductivity, salinity and other aquarium parameters. The monitoring system automatically alerts hobbyists by flashing if any of the set parameters deviate from the optimal range of readings. For example, the screen will flash if water temperature is too high or too low. The Hydrotech™ Performance Monitor also shows historical charts (typically 48 days) for different parameters, so the aquarium hobbyist can identify and address recurring issues. Another very attractive feature is the Maintenance Scheduler. Customizable to meet the needs of individual users, the scheduler serves as a reminder to perform important tasks, such as changing filter media. All of the readings, historical data and reminders generated by the monitoring system are presented in an intuitive, user-friendly form. 1. Mechanical Filtration Cartridge – Featuring a long lasting pleated pre-filter cartridge that traps significantly more debris than traditional foam filter models. This is a closed system in the Fluval G, so all water that flows through the filter must first pass through the pre-filter cartridge for pre-cleaning. The pre-filter cartridge is available in two formats: standard weave and 75μm for marine aquariums or water polishing in freshwater tanks. The effectiveness of the Fluval G’s pre-filtration process means that less solid waste is solubilized in the aquarium water for less waste accumulation and also makes the chemical and biological filtration components of the system more effective. 2. Chemical Filtration Cartridge – The Fluval G offers a combination of media options to make chemical filtration simpler and more efficient. Featuring high-capacity ionic exchange filtration media, the system will efficiently remove nitrates, phosphates and waste. For pure consumer flexibility, the chemical cartridges can be refilled with any type media the aquarium owner chooses. 3. Biological Filtration – The Fluval G Bio Baskets filled with the new Fluval G Nodes accommodate billions of nitrifying bacteria to purify aquarium water. The Fluval G’s biological filtration media comes in two sizes for maximum compaction and lasts six months before maintenance is required. The Fluval G’s filtration system also features extended contact time to clean water more effectively. All media used in the filtration process can be changed promptly with little or no mess and no disruption to the aquarium. The pre-filter and chemical filter media are housed in separate cartridges, both of which are readily accessible from the top of the filter. 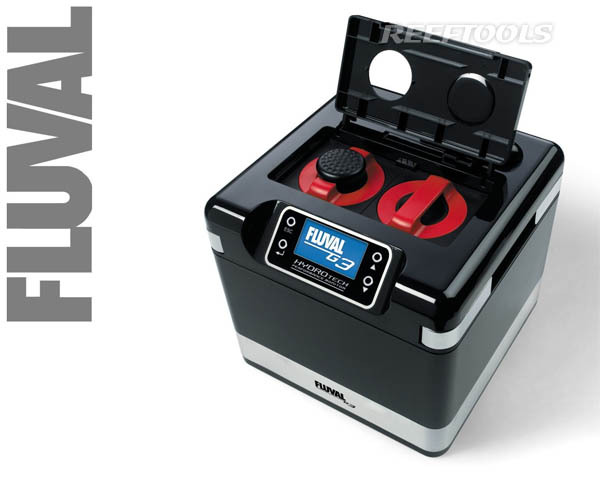 This timesaving feature allows hobbyists to remove the media for replacement or cleaning without having to disassemble the filter itself and disturb the biological filtration. Having filter cartridges readily accessible from the top of the filter is only one of the convenient features that make the Fluval G easy to maintain. The system’s proprietary Aqua Stop feature allows users to stop water flow through the filter, so its housing can be disconnected quickly and easily. Another feature, the Primer Button, starts water flow promptly without manual siphoning when the system is being set up or restarted. Other features, such as the silicon gasket and locking levers, contribute to the Fluval G’s long-term reliability, durability and quiet performance. The telescopic intake tube that adjusts to different aquarium depths ensures the optimal flow of water into the filter, while the dual output nozzles or spray bars help ensure maximum dispersal of water when it flows out. 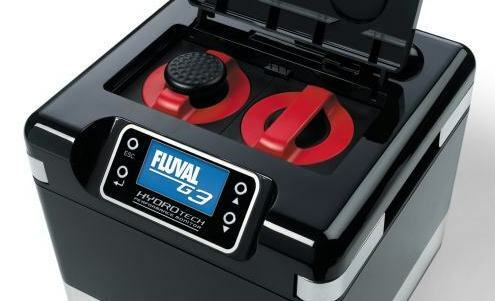 No possible enhancement feature has been overlooked in developing the Fluval G.
With its designer aesthetics, cutting-edge Hydrotech™ Performance Monitor System, superior filtration process and other performance features, the Fluval G Series represents not only the next step in the evolution of the Fluval brand. . .but the arrival of the future of filtration! This is the first o Hagen‘s 3-part series previewing their new Fluval G Series filter. Beginning 2 years ago, Hagen and Fluval had set out to develop the ideal aquarium filter. Hagen and Fluval realized just how important consumer input is to the development of new products, so over the past 2 years, the commissioned an independent research agency to hold focus groups in various locations around the world. To get further input, Hagen conducted online surveys and contacted hundreds of retailers and fishkeeping experts. The goal behind this momentous task was to achieve a better understanding of what today’s aquarists expect from the ideal filter. While aquarium filter technology has not changed in a major way in the last 20 years, that is all about to change as the Fluval G will launch aquarium filtration into the 21st century. The official debut of the Fluval G Series is October of 2009. We will keep you updated with the latest news.